Today, I'm going to run my "Incidental Iconography" column from last year's The Jack Kirby Collector #68, focusing on the Black Panther. It's one of the more interesting pieces of research I've done in that column, and it has some points about how Martin Goodman deliberately downplayed Panther's race against Kirby's intentions that I would like to see get wider circulation. If you’ve read my column before, you’ll know that I use take a look at how Jack would modify character designs on the fly, sometimes changing them from panel to panel, creating what ultimately become iconic visuals. If you’ve read my column before, you’ll also likely be familiar with Jack’s original sketch the Black Panther: a watercolor design he entitled Coal Tiger. So why would I spend time travelling over well-trod ground? Despite that original sketch being relatively well-known (including having been reprinted in this very magazine repeatedly) I don’t think many people have really looked at in comparison to Jack’s evolution of the design. I think people see it and think, “Wow, that’s… yellow!” without going much further. But we have some additional steps to examine before getting to the Panther’s formal debut in Fantastic Four #52. We of course start with Jack’s original watercolor. 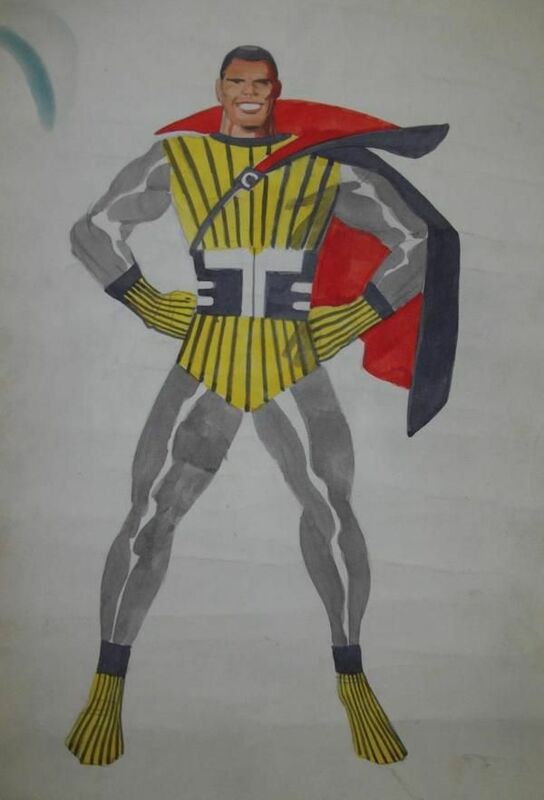 A non-atypical Kirby design, although he tended to avoid capes as a general rule. If Jack hadn’t made the character dark-skinned (which in 1966 was virtually unique) the cape is probably the most outstanding design element from Jack’s perspective. Take a moment, though, to look at the costume without the color. The changes between this design and the final Black Panther costume are minimal -- aside from the mask, the types of changes Jack might make absent-mindedly on any design from issue to issue. Really, besides only the removal of the stylized “T” on the belt and the vertical stripes on the tunic, the only change to the costume is in the coloring. Note that, although difficult to see in the final published comics with color, the stripes on Panther’s gloves and boots remain in place. Now, here’s some interesting considerations. We also have a rejected cover for FF #52 featuring the Panther, now named as such, wearing basically the Coal Tiger costume minus the stripes plus a half-mask. Since the final cover features a Panther costume that completely covers the character’s face, I think it’s safe to presume that either Stan Lee or Martin Goodman made a request to change to a full mask out of concerns of a potential backlash. Again, we’re talking about 1966 here, squarely during the Civil Rights movement. A year after the assassination of Malcolm X and two years before Martin Luther King, Jr. A good many people were uncomfortable with Black people getting increasingly equal rights, and those who supported them sometimes found themselves facing some arrest, imprisonment, or worse. Here’s another consideration, though: Jack usually drew his covers last. It wasn’t part of the story he was telling, so he’d dash something off after he did the last page because a comic needed a cover. Which means that we’ve got a 20 page story featuring the Black Panther in a half-mask basically done before someone suggested that maybe showcasing a Black person on the cover was too risky. This suggests to me that it was Goodman’s concern. Wherever you fall on the who-did-what debate between Lee and Kirby, Stan was certainly aware of the story being told beforehand, and he would’ve had ample time to mention to Jack that showing a Black man on the cover might be risky if that was a concern of his. Goodman was less involved in the day-to-day operations and probably only noticed the cover shortly before the book was ready to go to press. But changing the costume for the cover produces the additional problem of having to adjust the interior art to match. If you look at the story, you’ll notice that Panther’s mask -- indeed much of his costume -- is covered in shadow. But it doesn’t seem as if Jack drew it that way. There are no highlight details that one might expect around the nose and mouth; everything is just completely blacked out. As if inker Joe Sinnott (or, more likely, another inker who happened to be in the office that day) simply washed over the original, probably already inked, art with black. Indeed, looking at #53 and #54, Panther’s mask shows a greater level of detail with more highlights. It seems to me that tweaking Panther’s costume to accommodate a full mask was a rush job, done well after Jack had any input on the story. The costume that Jack drew in FF #52 was his Coal Tiger design with a half-mask added, and it was only really changed at the inking stage or later. By #53, Stan had evidently told Jack of the changes that had been made and the illustrations in that issue show that Jack refined the notion of an all-black costume by designing in appropriate highlights. And while many people point to Nat Freedland’s infamous “Super Heroes with Super Problems” article that ran shortly after this as the start of Jack leaving Marvel, I can’t help but wonder if that all of these changes to a character that he saw as part of an important social issue began influencing his decision to leave before Freedland’s piece. Did Jack really care if Panther’s trunks were black or yellow with black stripes? Probably not. But I expect he did care that the character he designed specifically for the purpose of promoting Black men as heroes being literally relegated to shadows out of fear of reprisal struck a bad nerve with him. Maybe the “baggy Robert Hall-ish suit” reference was the straw that broke the camel’s back, but seeing Coal Tiger become a shadow of what he could’ve been was the penultimate straw, even if the Panther’s ink-rushed design made the character’s costume about as iconic as they come.